Below is a diagram showing my main switch setup as of October 20, 2017. This switch was new to me, but used. I bought it on eBay for $300, a steal. It's cosmetically perfect and fully functional. 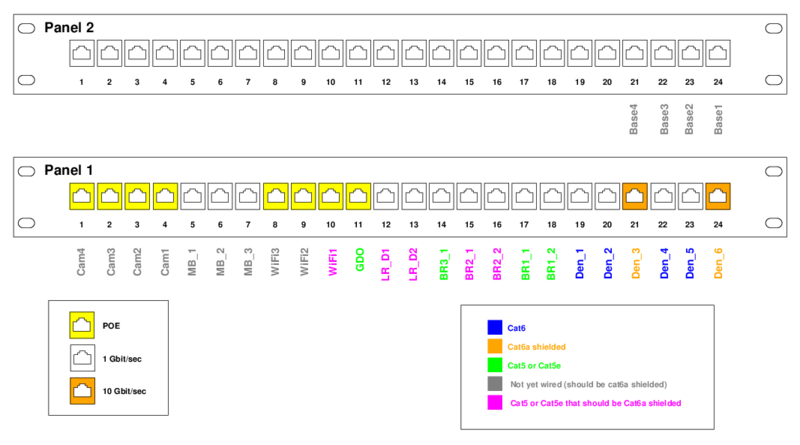 Below is a diagram showing my intended patch panel layout as of October 20, 2017. These are new patch panels received on October 20, 2017 from fs.com. 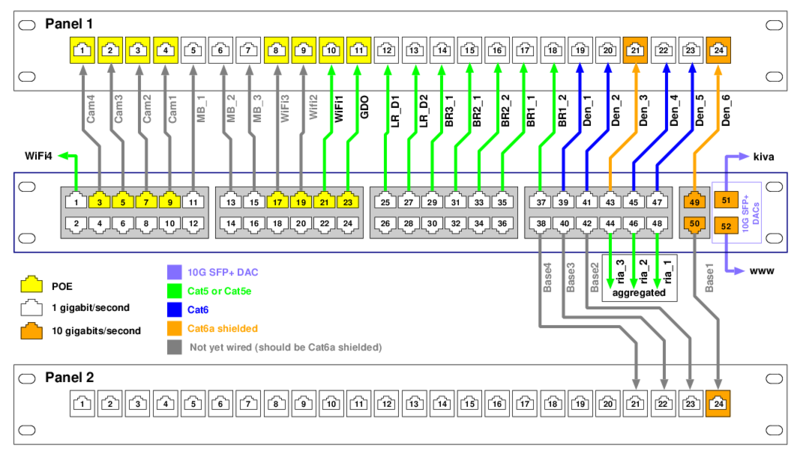 Below is a diagram showing the patch connections from the switch to the patch panels. I'll leave a printed copy of this inside the enclosure. Since I have many runs to various rooms in the house, I recently decided that having the switch in my rack is a bad idea since it forces me to have a ton of patch cables from the rack to the patch panels. So I built an enclosure to hold the switch and the patch panels, which will be mounted on the wall. 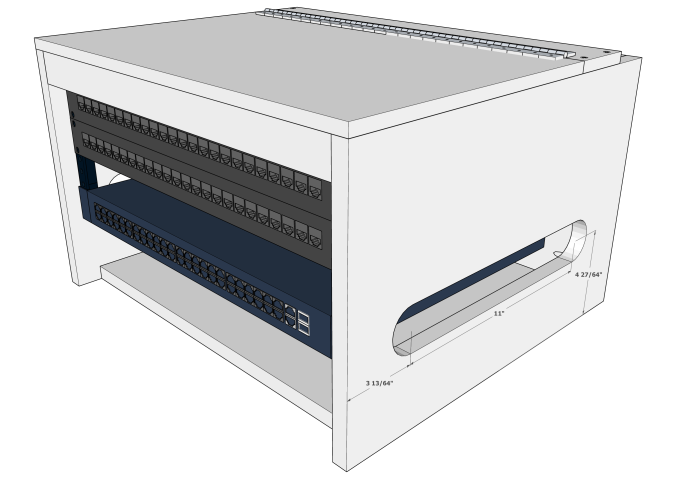 Below is a rough diagram of the new enclosure I created. The SketchUp file is PatchPanelEnclosure.skp. With the main switch in this enclosure with the patch panels, I only need two DAC cables and 5 ethernet cables between the rack and the new enclosure, versus more than 20 ethernet cables if the switch was still in my rack. I need more WiFi access points. I need one in the den since it's mostly blocked off from other rooms but Julie will want to use her MacBook Pro and iPad Pro in there. I also need one in the master bedroom for the same reason. Both of these should be Ubiquiti Unifi AC In-Wall Pro models since I don't have access to the ceilings. Ditto for Bedroom 2 if necessary, though it's quite close to my current access point. I need at least one in the basement, and one in the garage. The basement unit should probably be a Ubiquiti UAP-AC-HD since I'll eventually refinish the basement and that's where my home theater will be located. I should also probably replace my existing access point with a UAP-AC-HD, which would allow me to move my existing access point to the garage. I need a 10-gigabit switch for the den. So far I've had good luck with my Ubiquiti switches, so a second US-16-XG (like the one in the basement) makes sense. I already have a Ubiquiti US-24 in the office for 10/100/1000 devices (printers, WD MyBookLive, Ooma, etc.). I have 4 sets of LC MM fiber jacks in the den, and will dedicate 2 of them for uplinks. My hackintosh has an Intel X540-T2 card, I intend to buy a Sonnet Solo Thunderbolt 3 to 10Gbe adapter for my Macbook Pro, and I need 10-gigabit for any of Julie's future computers. So at a minimum I need 4 ports for 10GbaseT. The US-16-XG fits the bill, and I can always add SFP+ 10G copper transceivers if I need more ports. Distance isn't a concern here, the devices would be within a few meters of the switch. I need some patch panels for the den. My switches and UPS are mounted in a Middle Atlantic MDV-R12, which means they're front-mounted and hence visible. I need pass-through patch panels to hide the wiring, so I can just have short jumpers visible. A pair of patch panels would be ideal since it lets me easily segregate 10GbaseT and fiber from 10/100/1000baseT and the additional ports allow for shorter patch cables (6" in nearly all cases). The harwdired part of the wish list is now in progress as of March 31, 2019. See office network for more info.